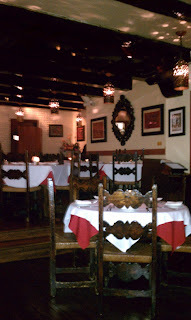 NYC Foodie Girl: El Parador: Mucho Bueno Mexican Food - Just Remove Your Sunglasses! El Parador: Mucho Bueno Mexican Food - Just Remove Your Sunglasses! I like that there are some pretty good places to get something to eat in my neighborhood. Believe me when I say they are few and far between in the Midtown East area. I live in a culinary desert by comparison to other parts of the City. I've sampled most everything on that menu because my husband is more adventurous than I am and he always insist that I try things that would normally make me wince. He's usually right when he says, "Try it! I promise you'll like it." I have to learn to trust the man... And I should trust them in the kitchen at El Parador, too. My husband told me a long time ago, "The chef doesn't want to put sh!t on the menu." Makes sense. A chef - a real, authentic, knows-what-the-hell-they-are-doing chef - would put dishes that are tasty, flavorful, and hopefully guarantee another visit back to their restaurant on the list. This restaurant really has some good dishes, even if the names seem a tad daunting. El Parador is just like walking in a dark cave -no matter what time of day you arrive. It's dark and to me, seems a bit medieval in its decor. So if that means it has to be a dark night in the middle of a sunny afternoon, fine. It's ok. Just remove your sunglasses before you walk in the door or you will think you have gone temporarily blind. I actually prefer its darkness over pinatas hanging from the ceiling and tacky statues of Mayan gods littered about an establishment. Back to the good things about El Parador... Service is really good, but make a reservation because this place fills up! And I know you're probably thinking, but it's on 34th Street - between 1st and 2nd... WTH? I'm telling you, after 6pm, it's like the flood gates open. The bar is quite lively and the tables are very busy with people gathering after work or just having a romantic table for two. If you're an Open Table fan, you find that many of the day/time slots are worth 1,000 points. It's just a huge incentive for some, so I thought I'd mention it. It's also the oldest Mexican restaurant in New York City... and definitely one of the best. It's been favorably reviewed by many. I'm just adding my two cents because I hope they remain here for many future generations to come. I've never been to El Parador, but I'm cautious to go knowing I may have to venture into a a culinary desert and then into a dark cave. But being the oldest Mexican restaurant in NYC, I'm always interested in a delicious bit of history! Thanks for the tip!